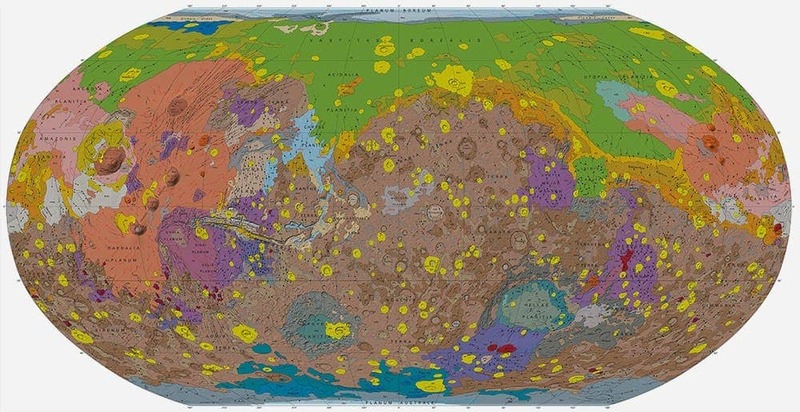 Humans have been studying the surface and geology of Mars through telescopes for over 400 years, but it was the Mariner 9 mission and the Viking Orbiter missions that first gave us a global view of the Red Planet and enabled us to create the first geological maps outside of the Earth-Moon system. But things have gotten even better after that, thanks to The Mars Global Surveyor, Mars Odyssey, Mars Express and Mars Reconnaissance Orbiter missions; with a myriad of sensors, they’ve gathered more and more information about the surface of the planet and the characteristics of the minerals that make it. The map is one of the several revisions that the USGS is doing, including for two of Jupiter’s moons, Ganymede and Io. If you want to see a (much) higher resolution version, with a color scale and explanations, check out this link.